How to MIG Weld Aluminum? MIG welding aluminum relies heavily on having the right equipment due to the soft nature of the welding electrode wire. With aluminum a special wire feed system is needed otherwise the welding electrode wire will break and bunch up. Once the right equipment is set up it’s a pretty easy metal to weld. The bottom line is, the bottom line, if you need to deposit a lot of filler wire in a production driven environment, then this is the right choice for this non ferrous material like aluminum and magnesium. This is all depends on the thickness of material that will be welded. You need the base material to be thick enough to handle the heat and most welds should be in structural shape form. If it is really thin aluminum then a TIG welder would be the best choice. The main trade off is the skill level needed to weld out of position. For most situations this makes MIG the choice of production welding used in shipyards, trailer building, and aluminum tank construction. The proof is in the skills level needed that shipyard staffing companies expect. For most recruiters hiring pipe welders (career welders who travel for work) they expect about half of the welders to fail their 6G restricted x-ray weld test. That is just a given! On hiring aluminum MIG welders they expect 9 out of 10 welders to fail the test. If you need to know, the test is a 2G, 3G and 4G ½ “ plate test that gets x-rayed. Not a big deal but that just shows the difficulty of MIG welding aluminum out of position. If you have a choice of processes for welding aluminum then it all depends on thickness of the material. 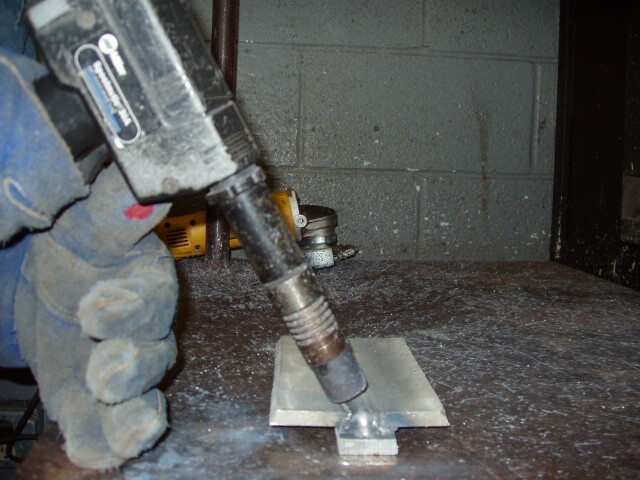 MIG welding is great on anything that is 1/8 of an inch or thicker and is in position. TIG welding works best on thinner stuff and pipe. When it comes to welding aluminum the gas choices and electrode choices are pretty simple! That is about it! The Argon/Helium mixture is only used on aluminum that is thicker then 1/2 of an inch. The helium mixed into the Argon helps create a hotter arc to penetrate aluminum. If needed you could still go with 100% Argon the all around gas for heavy plate aluminum MIG welding! Pretty simple! Here is the deal, you typically don’t want to use a wire thicker than .035 and the high the number the stiffer the wire. The ER5356 wire is much stiffer then the ER4043 wire. 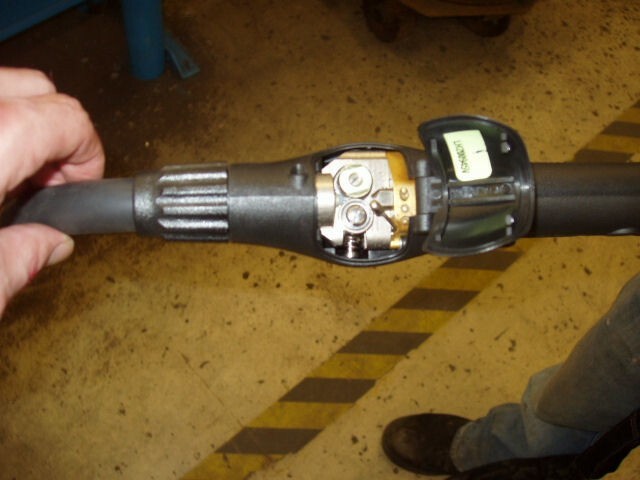 What that does is effect is how the wire will act in the wire feed system. Remember the special equipment is needed because the wire is too soft to feed the regular way. So any wire that is stiffer will have less trouble passing through the liner and to the gun. The push-pull wire feed system is most commonly used on factory floors. The way it works is the wire feeder pushes the wire as it normally would. Then the pull system is another feeder in the handle of the MIG gun that pulls it. This system works great when everything is set-up properly. The trick is to set-up the push-pull system properly (the hard part) then everything else is fine. The pro of this system is large wire spools can be used and down time is minimal. The first picture below is a double rollers push feed on a Millermatic 350P MIG Machine. The second and third pictures below are the bottom view, and top view of a Python pull feed gun. 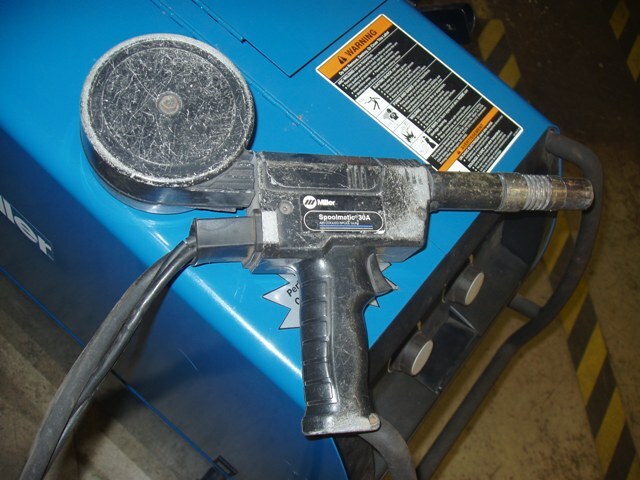 The spool gun is the best choice for welding out of position and small jobs. It is the most trouble free of the wire feed systems but comes with a price. 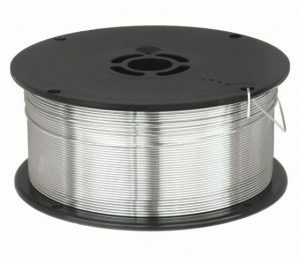 The wire can only be 1 lb (typically a 4" max diameter spool) or less in size. Not a good thing when it comes to production welding but again it works well in all positions. For rough stuff sanding or filing is fine! But if you are building a product like a ladder then an acid bath is you best choice. 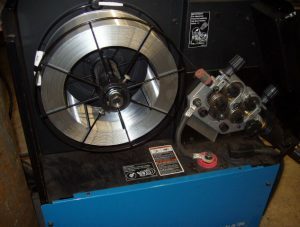 If it is rough work you can add a flapper sanding disk to your grinder or just grab a piece of sandpaper and go to work. The acid wash works great but there are some serious health issues when using acid. It all comes down to the needs of the product, how it must look finished and what your budget is. Welding aluminum is one of the few metals that do not require much bracing of the joints. There is minimal distortion and not too much to worry about. You just don’t get a better metal to work with. 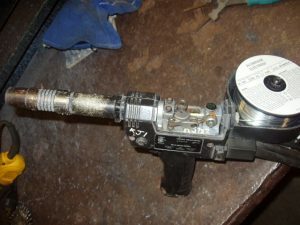 How to Set Up a MIG Welder to Weld Aluminum? 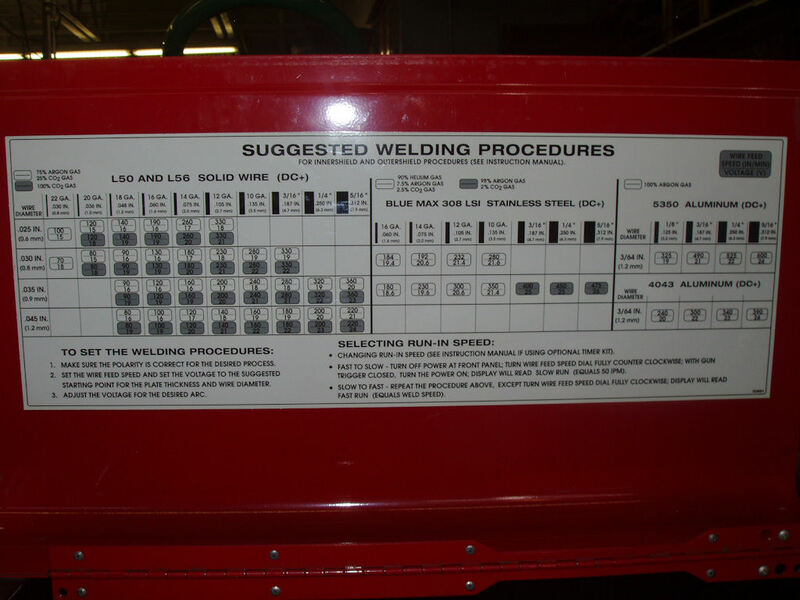 If you are ready to MIG weld aluminum then you need to know how to set your machine right! 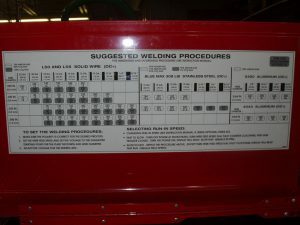 On many welding machines there is a chart that gives a recommended wire feed speed setting and voltage range. These are your BASIC Guidelines but you need to be adjusted till you get the right setting. 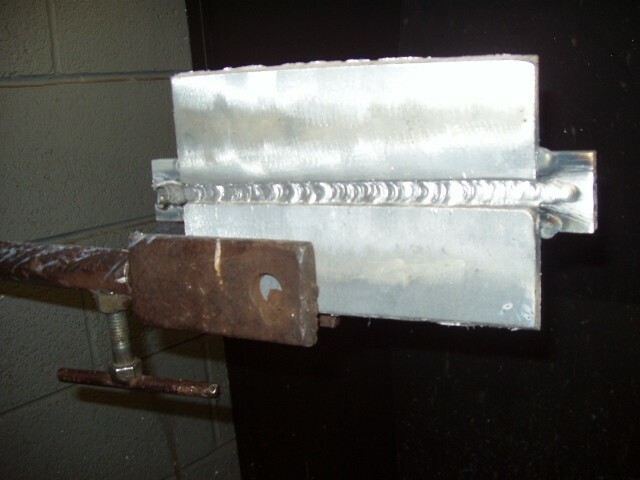 The settings needed to MIG weld aluminum are pretty much the same for all positions. In most cases it will take 21 to 23 volts to get the arc to spray transfer. If welding out of position you will want the wire feed speed fast enough to keep the weld full of metal at a fast crackle. Aluminum requires the wire feed speed to push the wire into the joint. If it slows for any reason you get a fused tip or get a weld that does not stick! Don’t be scared to turn up the wire feed speed! 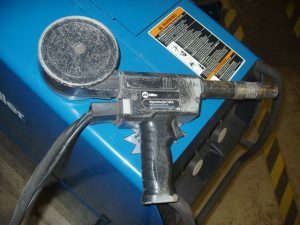 In most cases the weld will be done in a spray transfer mode. If you are lucky enough and have one of those pulse spray machines then the job will be much easier. Globular is used on thinner metals because the voltage setting is not high enough to produce a true spray transfer. MIG welding aluminum is position is done with a true spray transfer but welding out of position is either a globular or a spray transfer. The difference between a true spray transfer in the flat position and out of position is the sound of the weld. In position produces a hum or hissing sound. Out of position aluminum welding produces a FAST Crackle sound with white sparks flying and occasional spatter. Pulse spray takes advantage of varying the voltage so that the spray arc never gets to hot and never gets to cold. The best way to describe it is almost like spot welding but never shutting down the arc. It is a series of hot and cold welds that are working compensate for a lack of skill. For out of position MIG welding pulse spray cannot be beat. The BIG ISSUE when setting up you machine is the TEMPERATURE of the aluminum! If you are welding cold aluminum or spot/tack welding then machine setting are not issues. On the other hand is you are welding joints then temperature is a BIG ISSUE. When you start to weld a joint that is cold it will seem the heat is to low but as you go on the heat settings will seem too high. That is the BIG ISSUE with aluminum! The BIG DOWN SIDE OF OVERHEATING is the entire JOINT WILL TURN TO MUSH and FALL to the FLOOR WITHOUT WARNING. Yeah it is all going fine and all of a sudden it all just literally falls apart! This issue affects all types of aluminum welding that use an arc or flame to melt the metal. One of the reasons it is so difficult to detect the joint is overheating is the fact that the molten puddle does not look much different than the base metal. The puddle looks like tin foil moving. If this were steel there would be a bright red glow, the joint spitting sparks and you would clearly feel the heat is way too hot. Aluminum just requires a feel and experience to know that the temperature is not t0o hot. If you really want to be safe you can always get a heat stick to keep marking next to the weld to test the temperature. The techniques are no different except for the speed you need to keep in order to weld out of position. If welding in position there is lots of room for error because you have time to react. On the other hand out of position welding is more of a gut feel! Techniques for MIG welding aluminum are forehand welding and in most cases stringer beads only (yes you can weave but it is not worth risking overheating a joint). Out of position welding is a fast whipping or steady motion with a focus of staying ahead of the puddle. It is very odd traveling so fast compared to other welding processes and that is why the fail rate is so high among the shipyard welding tests.